Yes, the door is slightly warped. That’s why it was 80% off - perfect for a garage. 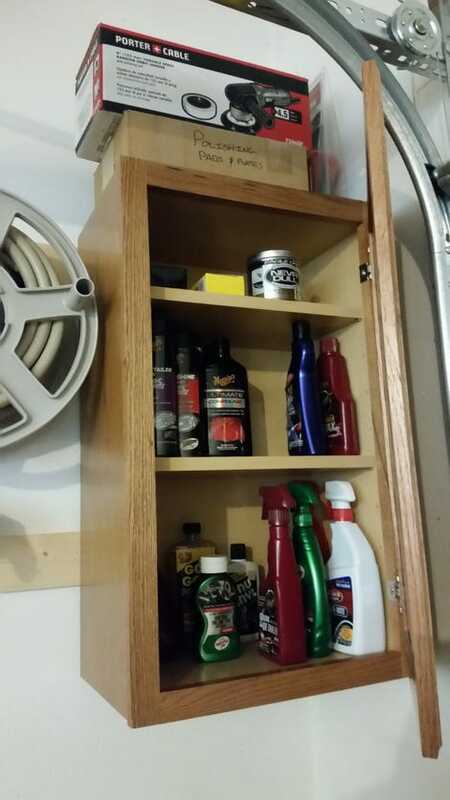 I had been keeping an eye out for a scratch ‘n dent wall cabinet for a while, with intent to put it in the garage near the hose/door to store my car cleaning supplies, which have spent the past several years in an old large-caliber ammo can. About a month ago I happened to notice an 18" oak wall cabinet marked at $20 (regular $100) with no obvious damage, so of course I bought it. It barely fit the space (I had been planning on a 15"), but I put up some boards this past weekend to mount it and hung it up yesterday. After putting a quick coat of paint on the new tie rod ends for the RX7 this evening (side rant: why does everything just come as-cast? I’d gladly pay an extra couple bucks per part for an oxide coating or some paint), I unloaded the ammo can and moved the Things into the cabinet. This will be nice come spring, when I can actually use this stuff again.